While packaged vegan butters serve an important purpose, it's nice to know you can make your own substitutes at home just as easily as you can run to the store. Butter is a mainstay in almost all traditional baking recipes - brownies, cookies, cakes, you name it. There are many ways to enjoy the dishes your grandma used to love by eliminating butter altogether. The following is by no means a complete list of butter replacements. They’re just the ones we like best. Coconut oil: In cookies, granolas, and baked goods, coconut oil works seamlessly. In fact, it’s great to use in just about anything made on a stovetop or in the oven. For recipes that call for melted butter, make sure you use melted coconut oil. Otherwise you’ll want to add it to your recipe in solid form. Amount: Substitute one to one. Unsweetened applesauce: This works well in any sweet bread or muffin recipe. It even substitutes perfectly in pre-boxed mixes, so if you’re craving that classic Betty Crocker cake you used to love, don’t worry, applesauce will do the trick and produce a rich moist texture. Amount: Substitute one cup to one cup of butter, as long as you’re okay with something mildly dense. Avocado pureé: At room temperature, butter and avocado pureé have virtually the same consistency. The creaminess and subtle avocado flavor lend themselves well to fudge brownies and other dark chocolate desserts. Amount: Substitute one to one. Prune pureé: Sounds strange, we know! Easy to make, and often reasonably priced, prunes also work well in chocolate dessert recipes. Combine 3/4 cup prunes with 1/4 cup boiling water, puree to combine, and go for it. Amount: Substitute one to one. Olive oil: In veggie roasts and stir fries, the occasional sweet bread, and brownies of almost any sort, olive oil does wonders. It's best to use light olive oil in baked goods. You can get away with regular olive oil in dark chocolate desserts, where the flavor won’t be as overpowering. Amount: Substitute 3 tablespoons of oil for 4 tablespoons of butter. Grapeseed oil: For more delicate baked goods, like cookies and cupcakes, which can’t withstand the strong flavor of olive oil, grapeseed oil can do the trick. Amount: Substitute one to one. Chia seeds: Combine 1 tablespoon of chia seeds with 9 tablespoons water, and let sit for 15 minutes. 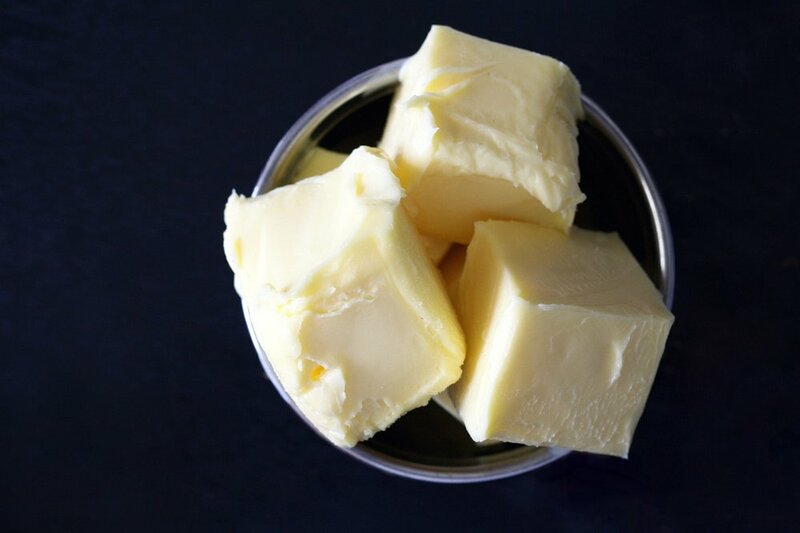 This produces a gel that can stand in for fats like butter. One word of caution: Don't try to cut out all the fat with this substitute. If your recipe calls for 1 cup of butter, use 1/2 cup of gel and 1/2 cup of vegan butter. We’ve organized a number of recipes that suggest alternatives to dairy options. Check out our Good Food Recipe Archive for a closer look. Some may take a little more patience than others but are totally worth it.